First, I find the color relaxing, easy on the eyes and very livable (important factor when you have to be surrounded by it for hours on end, like I am in my home office). Second, I wanted to give the room its own identity. My home is a split level and the office space is connected to the dining area of the kitchen on one side, and has a full bathroom on the other. The kitchen is painted a haystack brownish-yellow and the bathroom is a tan color with a slightly pink tinge. 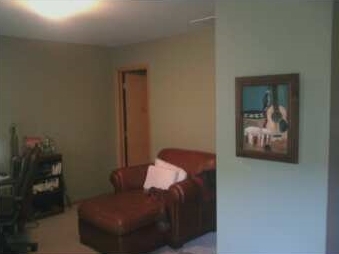 The office's original wall color was tan with a bit of yellow, so it was extremely similar to both of the rooms it bordered. I got exactly what I was looking for; the room is more comfortable to be in now (if nothing else it's one less thing to nitpick about the space I spend 11 hours a day in) and the change has helped to give three rooms in my home their own feel. My biggest piece of advice for first-timers is to get a decent step stool or ladder for the edging around the ceiling, along with a quality brush. You need a steady hand and a well defined brush tip to do the trim and ceiling edge, and the extra couple bucks will save you HOURS of frustration during the painting project. Colors make a tremendous difference in how you feel when you are inside a room. Thanks for taking the time to write on this topic in such a simple way. Return to Green Paint Colors.